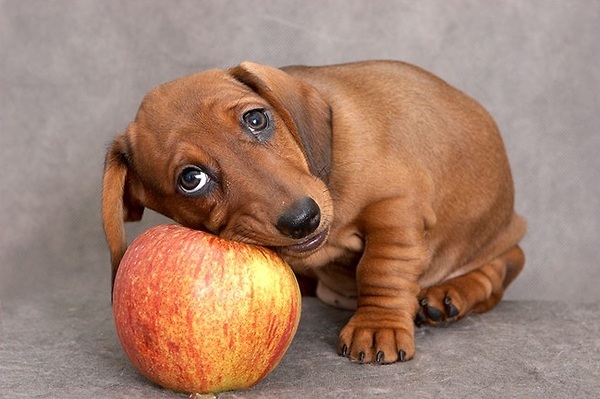 Loaded with fibre, phytonutrients, and vitamins, apples make for a tasty and nutritious treat for dogs. The apple seeds however contain cyanide which can harm your pooch when consumed regularly in large quantities. So it’s advisable to remove the seeds before feeding the fruit. A crunchy snack rich in potassium, beta carotene and fibre, dogs love to munch on this sweet and delicious veggie. Carrots also help prevent bad breath and maintain your dog’s dental health. Peanut butter is safe for dogs and our furry buddies just seem to just love this sticky and delicious food. Always opt for the natural and unprocessed variety of peanut butter and the one that does not contain added salt, sugar and preservatives. Since it’s high in fat and calories, use this snack sparingly, especially if your pet is overweight. Pumpkin is a good source of fibre and vitamin A. It’s easily digestible, low in calories, and helps relieve diarrhoea in dogs. It’s always better to go for fresh pumpkin. If you plan to get the canned one, make sure it’s free from sugar and preservatives. Yoghurt is a good source of protein, calcium, vitamins, zinc and potassium. When choosing yoghurt always opt for the fat-free version, and the one that does not contain sugar or artificial sweeteners. Whether mashed or dehydrated, sweet potatoes are wonderful treats for dogs. They are rich in dietary fibre and contain vitamin B6, vitamin C, beta carotene, and manganese. Green beans are a great source of fibre, vitamin K, vitamin C, and manganese. Being low in calories, they are a great snack for overweight dogs. Rice contains easily digestible carbohydrate, which makes it a great food for dogs, especially when they are having an upset stomach. There are different types of rice available in the market. Brown rice is considered healthier since it’s high in protein and low in fat content when compared to white rice. Oatmeal is a good source of soluble fiber. For dogs that are allergic to wheat, oatmeal can be a great alternative. It’s also beneficial for older dogs that have irregular bowel movements. A great treat for summers, this juicy and delicious fruit is as good for our dogs as it is for us. Make sure you remove the seeds before feeding it to your pooch. Ingestion of seeds in large numbers can be dangerous for dogs, especially the smaller ones. Hey, I couldn’t find an email address. Would it be possible for you to email me so that I can ask you a question?